05-Feb-2001 -- Just after reading about the existence of the DCProject in our newspaper, we were going to spend the weekend with some friends in the most southern province of the Netherlands called Zuid-Limburg. After checking the DCP website for several times to be sure, I found out that there was an unvisited confluence not far away. Some of my friends did not share my "Livingstone in Africa-feelings", others did like to idea to be the first on the confluence. Happily the last group did not own a GPS. On our way back home to the north we left the highway to find this confluence. According to our atlas at home, it should be just a few kilometers on the other side of the border in Germany, near a village called Gangelt. The first unpaved road we took happened to be the right one. It starts at a little parking place and led us directly to the right spot. The spot seemed to be just at the border of a meadow, which was closed by barbed-wire, so I had to cross it several times on my knees. While I was jumping around to find the exact place, concentrating on my GPS, I suddenly saw a sort of monument some 10 meters aside of me. Looking closer, it appeared to be a world globe made out of stone which was there because of the confluence! The spot had been made nicer with a sort of pick-nick place and some trees and an extra natural stone on the ground with a metal plate with inscription in remembrance of Mr. Mercator. There are agricultural fields around it and in the neighborhood there is a farm. The landscape is almost flat. We could see several wind energy generators around. 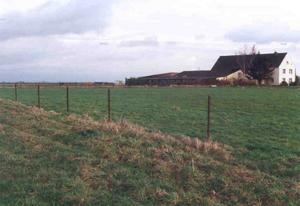 Some kilometers to the south are woods and moor fields. While taking my pictures, some children came from the village on there scooter to visit the place and climbing on the pick-nick table. When the sun came through the clouds on this rainy day, my wife Hiltje, who was patiently waiting in our car until then, put our 5 months-old daughter Jikke on the globe. To be a real confluence-hunter, one should start early! Back home I checked the site again and let the film develop a.s.a.p. Since then I started dreaming of very remote confluences, only reachable by a real expedition.